Companies that go all-digital with employee communications without closely examining the impact can actually end up spending more money, and their communications programs can fall flat, not reaching enough employees to make them effective. The truth is that before you eliminate print communications, you have to closely examine your company and your workforce to see if it makes sense. We recommend a multimedia approach that uses the combination of print and digital that works best for your company. We can help you map out the perfect mix. The goal to elicit engagement and the desired action is to reach people at least seven times—seven “touches”—during your communications campaign. If most of your team works in a factory, they probably don’t have frequent access to a computer on the job. They can’t really go online at work. In this case, printed materials, either mailed or posted in the workplace, would work better. Another issue to consider is whether your employee is the one who will make decisions about health insurance in the family; in many cases, it’s the spouse. To ensure they get important information throughout a campaign, consider the number of pieces that should be mailed to their home. Don’t count on the employee to pass on the word. Let’s face it: some older employees might not be comfortable receiving information through email or by accessing a website. If your workforce skews older, you probably can’t go solely digital. But if you have a lot of Gen Xers, they love PowerPoint. 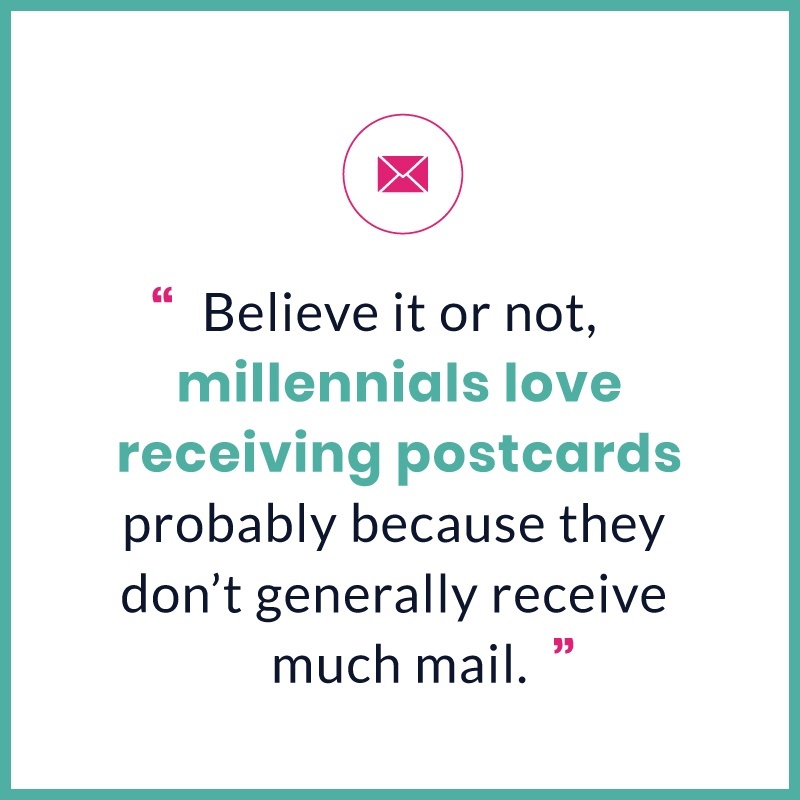 Believe it or not, though, millennials love receiving postcards— probably because they don’t generally receive much mail. Finding the right mix is all about understanding your employee population. People like to communicate at work the way they communicate in real life. You have to keep in mind the legal requirements that companies must follow when communicating changes about benefits, open enrollment, and the like. This information might have to be mailed; if it’s not, you face fines and penalties. Although it’s not best in all cases, digital communications do offer some clear benefits. With digital employee communications, one major advantage is that you can better track employees’ usage of the materials you send out. With print, you send out the postcard or letter and include a call to action like registering on a website to attempt to track it. An employee may have read what you mailed but how do you know if they didn’t complete the call to action. For example, if you put information about a certain benefit on a website, you can track how many visits that page gets or how long people are spending on that page. With emails, you can track open rates and click-throughs. This allows you to generate analytics you can use to fine-tune future messaging in communications campaigns and focus on specific programs, or eliminate the ones that aren’t being used and aren’t worth spending money on. Often, we’re surprised by the “winners” as far as traffic to specific pages. In one case, we had only one view of a web page for TeleHeart, a benefit available to employees… and that view was probably our contact at HR testing the page! We— and the client—were blown away; they were spending a lot of money on that benefit, and it simply wasn’t being used. That’s the sort of hard data you can use to make decisions. If you surveyed employees, they’d say they love it… employees will never tell you they don’t want a benefit. One client of ours, Ocean Spray, was very reluctant to go digital at all for employee benefits communications. They have lots of plant employees, so we used a tiered approach. We started going digital with their corporate employees, who had frequent computer access. We got positive feedback. Then we rolled out a combination digital and print campaign to test the waters with the plants. The mark of success: they didn’t have many people come in for the print version. By year three, Ocean Spray moved their benefits guide to a full HTML website, supplementing with one piece mailed to homes which directed people to the benefits website for more information. Success! Both print and digital communications offer clear benefits. The key is to figure out how your employees like to be contacted. Also, keep in mind your employees’ role in the workplace, age, who the family’s decision-maker is, and any compliance issues. Often, you’ll use a mix of both channels to convey benefits information—whatever creates the highest levels of engagement among your employees.